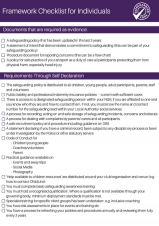 Safeguarding should be a top priority for all those involved in every sport, whether a club, organisation, an individual or as a parent. 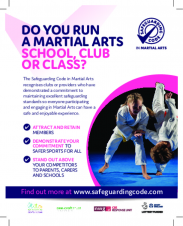 Over 200 clubs, with in excess of 20,000 active members, have already registered for the Safeguarding Code in Martial Arts and are working towards achieving the mark. 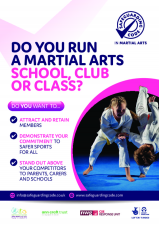 Below are some useful resources - a poster, a parents leaflet plus 2 x checklists, one for individuals and the other for clubs which show what documentation is required in order to attain the code.